Rayon booklet approximately 10.7 x 13cm, 32p. These were produced for use in operational theatres where the latin alphabet wasn't used. It allowed the airman to point to a useful word or phrase allowing the native to see it in their own language alongside. 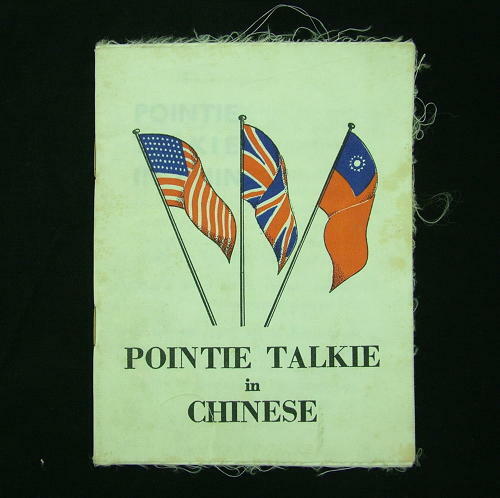 This one includes such phrases & questions as 'I am an English airman, I want to get back to allied territory to continue fighting', 'do the Japanese patrol this area? ', 'You will be well rewarded when we reach Allied troops', 'what sort of guns?' There is also information on gestures, months and days etc. The pages have raw unhemmed edges and these have light fraying. The booklet has just minor soiling and is generally in very good used condition. A scarce item. Stock code E22691.